Just a month ago, Pinstagram was launched, a combination of the two of the amazing social media sensations on the internet. Pinterest + Instagram! As they proclaim, it certainly is a visual treat and most definitely the best way to view your Instagram photos on the web. 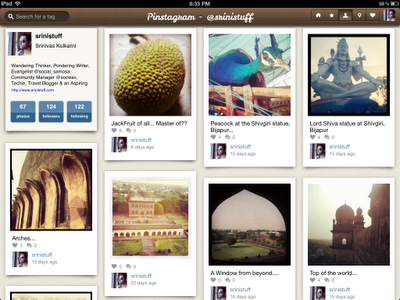 Yes, that’s right, a complete experience of your Instagram feed on the web in Pinterest style. The beauty of Instagram photos with the elegance of Pinterest. And, just a few days ago they also launched their iPad app. So if you haven’t already started using it on the web, we recommend you do and the ones who have an iPad, we recommend it as a ‘Must DO’ especially if you are an avid Instagram user and love Pinterest too! So, on behalf of Social Samosa, I decided to speak to the Co-creator of Pinstagram and Managing partner at FireSnake labs, Pek Pongpaet and figure out what their plans are for this very interesting mashup product of theirs. It’s a combination of Pinterest and Instagram with the best of the both interfaces. Most importantly it’ll allow you to view your instagram feed on the web and now on your iPad. Pinstagram lets you view your feed, popular photos, and more. Pinstagram was created by Brandon Leonardo and me as a weekend project. We were jokingly throwing around ideas and thought a Pinterest for Instagram would be a funny concept. What would happen if you combined the two of the fastest growing, and hottest web properties? With Pinterest and Instagram being one of the hottest properties, did you anticipate similar services already existing, as your competion? I think there is always room for more or better. If you think you have a better idea or a different take on an idea you should do it. Just because the Ford Model T was around does that mean Ferrari, Porsche, BMW should not be making cars?